I don't know why going to the grocery store seems like such an overwhelming chore to me, but it does. What on earth do I have to complain about? It's not like I have to wait in a line for bread or can only buy from a limited selection. This is after all, America. I'm spoiled by the varieties and quantities of food available, at all hours of the day. I know I take it for granted, and often whine about grocery shopping. Somebody slap me. I bribed myself into going this morning with the reward being a pumpkin spice latte when I was finished. I also told myself it was okay to take my unshowered self right after dropping Annelise at school, wearing the t-shirt I slept in and my schleppy black knit pants. My apologies to fellow TarJay shoppers. But you know what? There were other people there that were just as schleppy, so I must be part of a trend. Who knew? There was no traffic, the store wasn't crowded, I was able to get my groceries AND pick up Dan Brown's new book, The Lost Symbol. I know, I know, I fell for the hype. I resisted reading his other books, but gave in to this one because the story is set in Washington D.C. What can I say, I'm weak. It was conveniently stacked right beside the checkout line, those TarJay people are so clever. I grabbed one from the very back. Do you do that too? I never, ever take one from the front because the ones in front have been touched, opened and perused. The horror. I also picked up my favorite lipstick from 1989 (you may have noticed I've been a little stuck in the past lately). It's by L'oreal and I'm worth it. The color is Mica, somewhere in between pink and mauve with some sparkle. I needed a little sparkle in my schleppy pants. 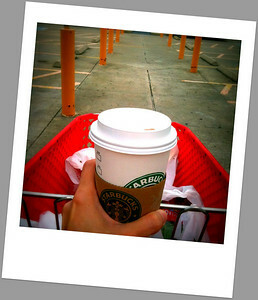 On the way out I picked up my Pumpkin Spice latte reward and enjoyed the slight breeze on the way to my car. The temps are hovering in the low 70s, so I guess it's finally fall. Pumpkin spice at Starbucks: fav! creepy. You are officially one of my soul sisters!!!! I used to wear Mica too! I totally forgot about it, how funny. I like seeing shleppy moms at Target in the morning, it's real. I'm disturbed by the fembot women perfectly coiffed and in heels. I know the Michael Buble version of this song and totally love it! Whenever I rank my itunes libary by most played that song comes up.